After two years of absence and several shows in Berlin, Amsterdam, London and Ibiza the Berlin based house music label Selected, whose more than ever sky-rocketing YouTube channel meanwhile hit the milestone of 2 million subscribers, is gladly coming back to Kaufleuten Club for the second time this year. The first edgy gig was massive and hugely successful what's pretty promising in the regard of a slick continuation. As a matter of fact, this is where back in the days its event brand was born. Proudly presenting Kaufleuten novice JONAS BLUE without controversy one of the scene's present shooting stars only Selected is facing a homecoming though. 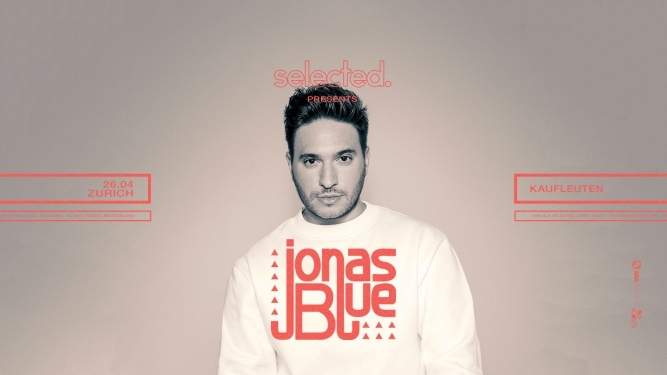 Jonas Blue performs featuring SONS OF MARIA, JOEL FABRICE and other friends playing alongside. Long story short, when it comes to outstanding live events Selected and Jonas Blue definitely can be considered as a safe value. So who is up for some good music and another memorable night at Zurichs most beautiful venue which is always good for a slight magical touch of its very own?